For his next passion project, the artist is creating a spa for queer, non-binary and trans people. In summer 2016, in the wake of Pulse nightclub shooting and police-shooting deaths of Philando Castile and Alton Sterling, artist Jon Wang found solace in silkworms. And it’s to silkworms that Wang returns with “Garden of Perfect Exposure,” the artist’s contribution to SculptureCenter’s latest group show, In Practice: Another Echo, curated by Allie Tepper. Wang’s piece, named in honor of “the Garden of Perfect Brightness,” the lush Imperial gardens destroyed by Anglo and French forces during the Second Opium War, in 1860, is a silkworm habitat writ—and voiced—large: the viewer steps through weather stripping into a warm chamber; the worms’ preferred climate. 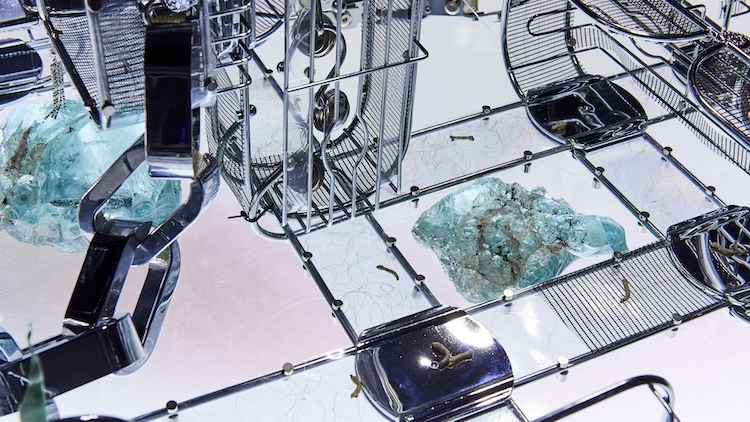 In the center of the room stands a messy tangle of bath-caddies fastened together by magnets and with pathways made from roofing material, Plexiglas, and other everyday materials, including laminated pieces of Wang’s own hair, i.e. : the “reimagining biological material as building material.” This is the core habitat, a video of which is splashed across the walls, as the perspective constantly shifts from worm to viewer—all narrated by Wang’s voice. Sometimes narrating the worm’s journey. Sometimes whispering to them softly. Wang traces this interest in space manipulation to a childhood spent between the U.S. and Asia, often wherever his Chinese Christian missionary parents were stationed. It was an unmooring experience, and interior work settled Wang’s nerves. “I spent a lot of my childhood rearranging furniture,” Wang recalls. “Creating spaces that I felt comfortable in was very important to my well-being.” All that interior work served Wang well in 2013, when Wang and business partner Sean Roland launched ZÉZÉ Hotel, a hospitality and art space in Hudson, NY. 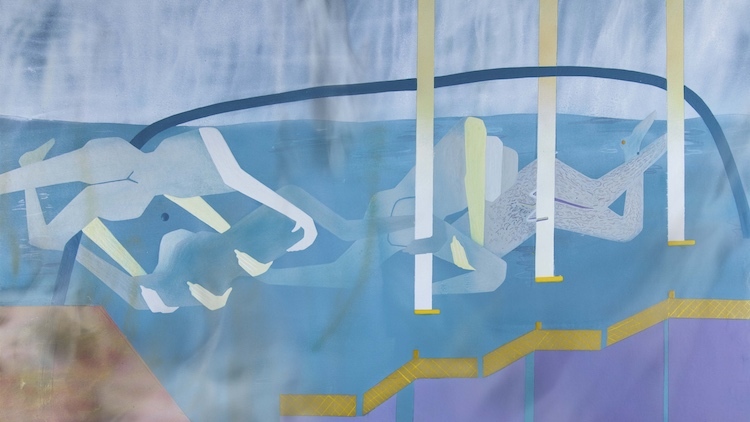 Painting by Maryam Hoseini for S H U I and PIN–UP. SHUI will feature all the amenities one expects from a downtown Manhattan spa—steam rooms with herbal aromas and saltwater pools—but visitors, clad in unisex bathing suits developed with rotating artists, will be given more power over who sees and doesn’t see their bodies thanks to walls that go from transparent to opaque at the push of a button. 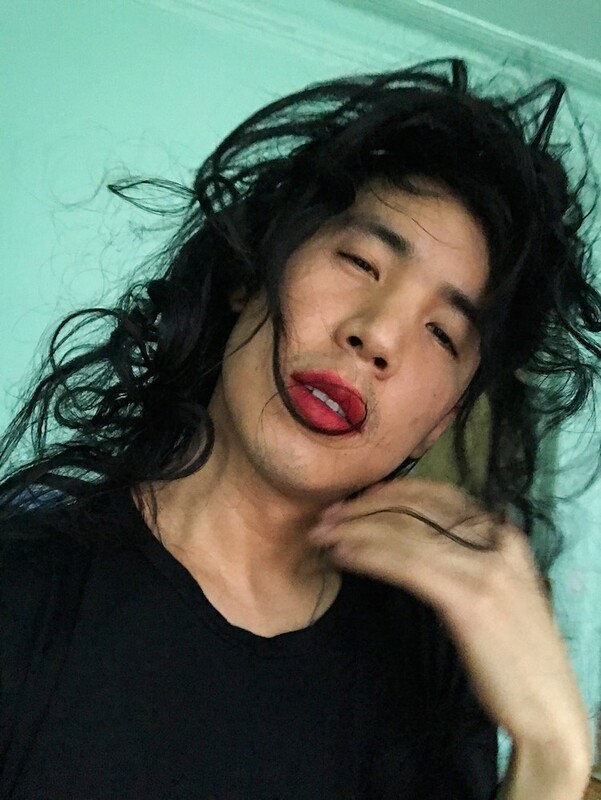 Removing the spa setting from its traditional gendered neuroses and concerns, Wang’s concentrating queerness, creating a self-contained but potent antidote to toxic heteronormativity that’s grown thicker in recent months: in development since 2013, SHUI at one point looked like the realization of a progressive promise, the end result of a more inclusive society; now it seems like resistance. “It was always urgent to me,” Wang says, “but that feeling has intensified now.” And though this may not seem that powerful—an artist’s queer spa in downtown Manhattan—just remember the silkworm, a creature whose gossamer yet muscular release changed the world.